The commonality of Favites Corals with the Favia genus, is in their colorfulness and ease of Care! The Favites Corals, along with the Favia genus, are attractive large polyp stony (LPS) corals. The Favites genus can sometimes be the more brightly colored of the two, but both groups come in pretty greens and browns, yellows and creams, and there's a slight chance of orange/red tones. Mixes of those colors are also seen with their "walls" being one color, and the calices "centers" being another, making for very attractive reef tank additions. The Favites Coral is typically confused with the Favia genus, but it is actually quite easy to tell them apart with a little practice. The walls of the corallites, the raised areas in which polyps reside, are shared or fused in the Favites species, whereas the walls of the Favia genus are not. So when the tissue is recessed at night, on the Favia corals you can see two "sets" of walls between the calices (centers). Besides being fused, the walls of Favites Corals are also higher and they are shaped more polygonal and uneven. In the wild, colonies of Favites Corals are flat, dome shaped, and massive. They can get to over 3 feet (1 m) in diameter. Some common names these corals are know for are Pineapple Coral, Moon Coral, Brain Coral, and Larger Star Coral. They are sometimes incorrectly called the Closed Brain Coral. This is actually a Favia name, which the Favites Corals resemble superficially. The Favites genus is easy to care for as long as there is proper lighting, water movement, and regular feedings. They are an excellent choice for both the beginner and the advanced aquarist. Once placed in the aquarium, if left undisturbed for several months they can attach to what they are set on, and become a pretty and natural focal point in the aquarium. Favites Corals have been propagated in captivity, yet propagation takes a long time, so they are still being collected from the oceans reefs. Favites Corals are also a little harder to frag since you cannot cut between a shared wall, you end up with damage to the surrounding calices . All that said, the Favites species are relatively easy keepers, and a great addition to any aquarium! Favites are great corals for beginners to advanced! They have a beauty all their own, easily maintained with proper lighting and regular feeding. This coral has a green oral disc or center with a gray to bluish purple walls, depending on lighting. Favites acuticollis is listed as near threatened on the IUCN Red List for endangered species, yet captive bred specimens may be found. Provide a tank that is at least 50 gallons. 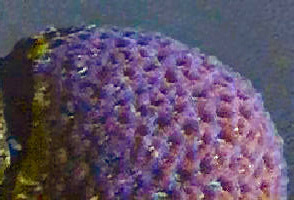 True to most LPS corals, Favites are hungry and need to be fed regularly for best health. Favites require a tank that is at least 50 gallons and plenty of light, with temps from 77 to 80˚F. Favites pentagona, sometimes called the War Coral is found up to 131 feet in tropical waters. They can even form irregular columns and colonies can reach over 3 feet across! Place on sand bed or on lower rock work, out of reach of other corals due to their strong sting. This video of Favites abdita spawning in the ocean gives first the idea of the size of this coral and color. Many of these corals brighten up under proper lighting and moderate water movement. It is amazing how much food this coral is actually producing for the ocean animals, as well as reproducing! Keep these corals at least 8" away from other corals due to their aggression! This Favites seems to fit the description of F. complanata. Grows in a mound or dome shapes and is normally brown with centers that are grey or green with walls that are angular which cause various corallite shapes to form. We can see the brown coloring which looks like a tan and the gray and green centers and the angular walls make for an interesting shape to the corallites! This Favites fit the description of Favites magnistellata, since it is the only one with orange centers. "Massive with various colors including grey, green, orange and pink. They have calices that are shallow and about 1/2” (13 mm) in diameter and are closely spaced and can vary in shape." It is easy to see the orange centers and the close polyps. This crab shows why they are not a welcome visitor to an captive reef, as it is stealing the food from this coral. This species was formerly in the Montastrea genus as M. magnistellata. Distribution / Background Favites Coral Information: The Favites genus was described by Link in 1807. There are about 23 nominal species, approximately 15 of which are true species with at least 7 being found around Australia. The true species include: F. abdita, F. acuticollis, F. bestae, F. chinensis, F. complanata, F. flexuosa, F. halicora, F. micropentagona, F. paraflexuosa, F. pentagona, F. peresi, F. russelli, F. spinosa, F. stylifera, and F. vasta. Common names for these corals are Pineapple Coral, Moon Coral, Brain Coral, and Larger Star Coral. The Favites genus has been propagated in captivity, yet propagation takes a long time, so they are still being collected from the oceans reefs. Where Favites Corals Are Found: The Favites genus are found across an extremely wide range, from the Red Sea south to the tip of Africa, and then eastward across the West Indies and the Indo-Pacific; The eastern extension is bordered on the south along the northern two thirds of Australia, north to Japan and eastward to the Pitcairns Islands. Favites Coral Habitat: The Favites genus live in a wide range of habitats on the reef. These habitats include different lighting, yet all have moderate turbulent water movement. They feed at night, extending tentacles and deflating their tissue. Description What do Favites Corals look like: In the wild, the Favites genus form colonies that are flat, dome shaped and massive, getting to over 3 feet (1 m) in diameter. The Favites Corals have corallites (skeletal wall structure) that are cerioid, or sharing of common walls. This is different from Favia corals, which do not share walls and so are easier to frag than Favites. During the day the tissue of the Favites genus is expanded. Consequently some of the Favites can superficially resemble Favia corals, since it can be difficult to see the distinction between the corallite walls. At night however, the tissue deflates somewhat, showing the wall differences. The colors of the Favites Corals are similar to the Favia genus, being green, brown, yellow, cream, orange and red tones. There can also be mixes of those colors with the "walls" being one color and the calices, "middles" being another. At times, the Favites Corals can be brighter than the Favia corals. The Favites Coral can attach to what they are set on if left undisturbed for several months. Difficulty of Care Favites Coral Care: The Favites Coral is relatively easy to care for, making them an excellent choice for the beginner. They need proper lighting, water movement and regular feedings. These corals, with their variety of color, are actually tolerant of several lighting conditions, though higher light is preferred. Like other members of the Faviidae family, the polyps tentacles come out at night to feed. Foods / Feeding Favites Coral Feeding: The Favites genus, like other large polyp stony (LPS) corals, have developed several feeding strategies. Through a symbiotic relationship with a marine algae, known as zooxanthellae, they receive some of their nutrients. They also capture planktonic organisms, food particles from the water column, and can absorb dissolved organic matter. In captivity, the Favites Coral needs to be fed at night when their tentacles are out. Feed mysis, diced fish or shrimp flesh, and other similarly sized foods. They do need to be fed at the very least, once a week and grow quite well with regular feedings. Aquarium Parameters A well-feed live rock/reef environment is what is needed for your Favites Coral, along with some fish for organic matter production. A mature tank is recommended. Be sure to have proper water movement and provide sufficient lighting. With their different colorings, Favites species can be tolerant of several lighting conditions, though higher light is preferred. Along with adequate lighting, provide a moderate water movement for the best health. This is an aggressive species, extending their sweeper tentacles at night well beyond the base. There needs to be plenty of space between it and other corals. Compatibility and Social Behaviors The Favites genus is aggressive towards other corals. They do need distance between them and other corals due to their long sweeper tentacles that extend at night. Breeding and Reproduction The large polyp stony (LPS) corals are are hermaphrodites, male and female within the same organism, and can reproduce both sexually and asexually. In the wild they reproduce sexually by releasing eggs and sperm at the same time, resulting in a fertilized egg which then forms into a free-swimming planula larva. Eventually the planula larvae settles onto the substrate, becoming plankters. This then forms a tiny polyp which begins to excrete calcium carbonate and develops into a coral. Planula larvae are extremely vulnerable to predation, and very few survive. The Favites genus are hermaphrodites that fertilize externally through mass spawning events, and this genus reproduce asexually as well. In captivity, the Favites genus can propagate by fragmenting and by extratentacular budding, which is budding on the outside edges and sides of the colony. They will also use polyp bailout and polyp balls to reproduce. Propagation is a little more difficult for the Favites Coral. Since, unlike the Favia genus, they have shared corallite walls, it is better for them to simply allow budding. However if you are going to propagate, start with a fully acclimated specimen. The Favites species have a dense skeletal structure, so safety glasses are necessary. Use a high speed lapidary blade. Though other blades can work they tend to leave wider cuts. Do not use stone or composite blades since they shatter easily. Since the corallites have shared walls, you will not be cutting into the wall but along their sides to preserve the walls. You will be cutting into the calices, and the calices "centers" that are surrounding what you are fragging will have to be sacrificed. Make sure the frag has good water flow to help it heal. Potential Problems The Favites genus are attractive and durable when their needs are provided for. They are susceptible to hair algae if the water movement is not sufficient. Availability Favites Corals for Sale: The Favites genus is very easy to find at pet shops and on line. Online they can run about $34.00 USD or more depending on size and/or color.